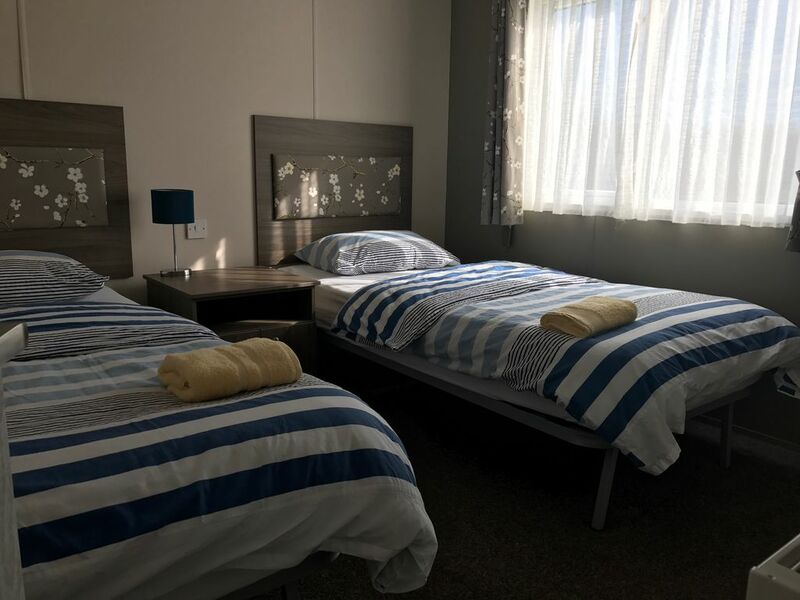 The lodge is fashionably designed to accommodate a family of four, it has all the amenities on offer to make your stay as comfortable as possible. It sits in a prime location at park resorts, far enough away to be relaxing but close enough to walk to the beautiful beach and dunes at camber sands. If you want to use the facilities at the park, they are there to be enjoyed at a small cost to the park, but if you want to relax and enjoy the decking, barbecue and outside lounge furniture, it's all there at your fingertips? Rye is only a short car journey, you can walk along the beach or there is an off-road path if you fancy a lovely stroll into town. The lodge has one double bedroom, with an en-suite and a twin room with the main bathroom. It offers a washing machine/tumble dryer, fridge freezer and cooker. There is a large flatscreen television and a cosy electric fire, for those romantic nights in. You can order a take away to be delivered or walk down to one of the lovely bars near the beach for supper. There is gas central heating, we supply all the bed linen and towels to make your stay as stress-free as possible. There are shops in camber to buy groceries but if you want to venture into Rye, it offers amazing pubs, restaurants, supermarkets and wonderful antique shops to enjoy. We only allow a maximum of 4 guests per stay, and a minImum booking is for three nights only. Serenity Lodge is operated so that Check-In and Out are on a Friday if staying for the week. Camber Sands is a 40-minute drive for us from home, and it has the nicest beach this side of the channel (favouritism obviously) we stayed in a caravan on the park with some friends and enjoyed ourselves so much by the end of the weekend we had put a deposit down on Serenity Lodge. The lodge has a lovely south facing decking, so it captures the sun all day, with plenty of outside space, with the rattan sofa's, dining table and BBQ/pizza oven. Serenity Lodge is a 5-minute walk from the 7 mile long sandy beaches that are renowned at Camber, with the dunes to explore and the Kit Kat Cafe to stop off for a Cappuccino. Rye is 5 miles from Camber Sands and can be walked if you are feeling fit, or a 5-minute drive, there's plenty of parking. Rye is very quaint, with lovely bars, cafes, restaurants and lots of culture. Our American friends thoroughly enjoyed their stay, as did we. It was warm and comfortable and lovely and quiet. We even saw a badger every night, doing is nightly forage for food. We were ideally located for Rye (beautiful town), Dover, Canterbury and Hastings (though we were disappointed in Hastings). Overall a lovely stay and would do it again. Simply amazing, perfect location and beautiful lodge. Excellent stay, definitely going back . Already planning the next visit. At Camber Sands there are four fantastic heated indoor swimming pools with a water flume and great aquatic activities that are sure to give the kids a splashing good time. The adventure playground, crazy golf course and go-karting course offer fun family thrills back on dry land, with a multi-sports court that’s perfect for an energetic afternoon game of basketball, football or netball. all are provided by Parkdean Resorts at a small charge per family.